Happy 4th of July desserters!!! We know that the Fourth of July can be a day filled with hotdogs and hamburgers so here is a very healthy dessert to bring to your party! It’s easy, refreshing, and most importantly….patriotic! All you have to do is buy juicy strawberry’s, baking white chocolate, and navy sugar crystals. 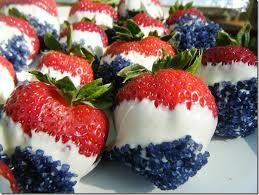 We are positive this dessert will be loved by everyone and a guilt free way to celebrate America’s birthday! Rinse each strawberry with cold water right before use and pat dry with paper towel. Cover baking sheet with waxed paper. Heat white baking chips with 1 tablespoon shortening in a 2-quart saucepan over low heat, stirring constantly until all chips are melted. For each strawberry, poke a fork or toothpick into the stem end and dip 3/4’s of the way into the melted chocolate. Next dip the bottom 1/4 into the sugar crystals. Place on waxed paered cooking sheet.